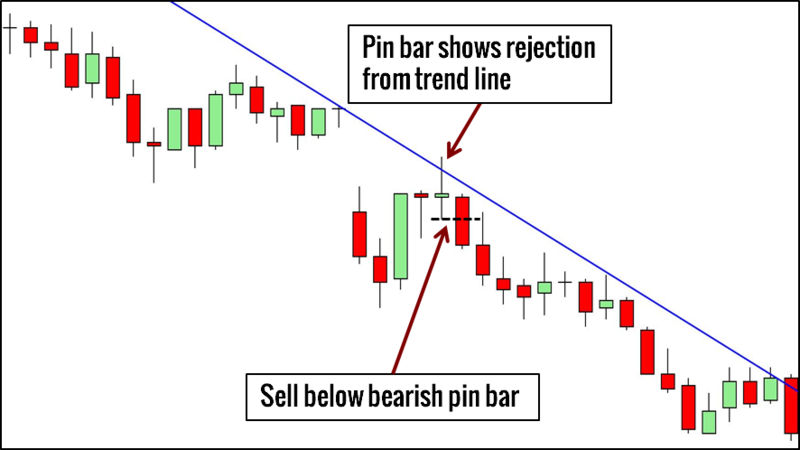 Bar patterns are nifty short-term patterns that are useful for timing trades and finding logical stop-loss points. 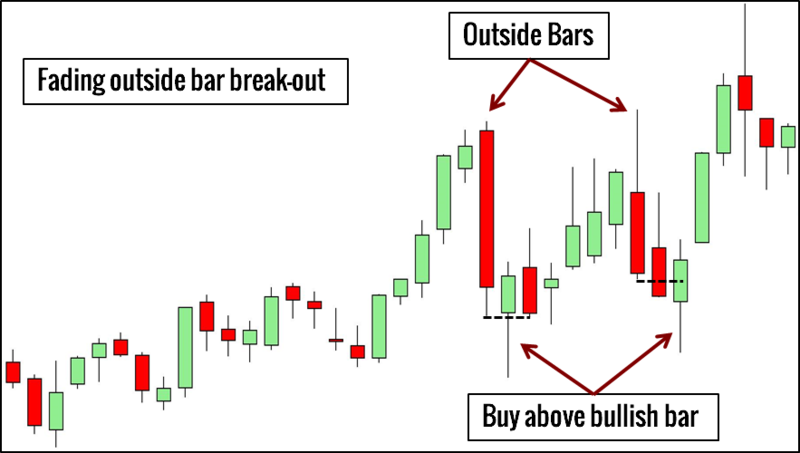 No price action trader can do without learning about bar patterns. So these are 10 bar patterns that you must know. 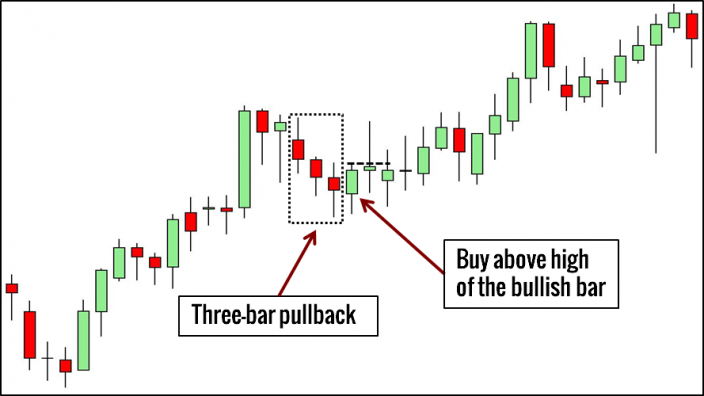 A bullish reversal bar pattern goes below the low of the previous bar before closing higher. 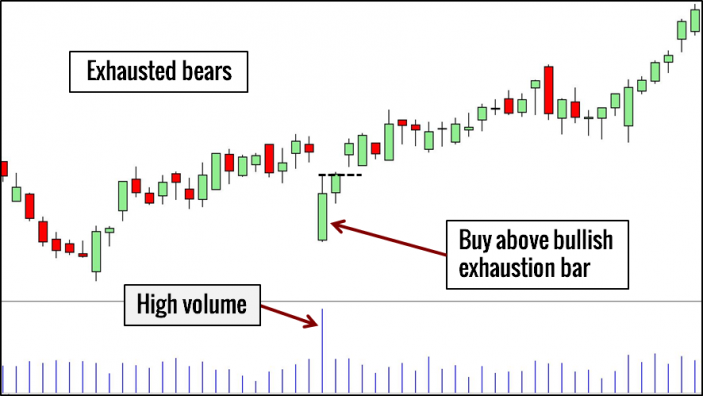 A bearish reversal bar pattern goes above the high of the last bar before closing lower. For the bullish pattern, the market found support below the low of the previous bar. Not only that, the support was strong enough to push the bar to close higher than the previous bar. This is the first sign of a possible bullish reversal. For the bearish pattern, the market met resistance above the high of the previous bar. Furthermore, the resistance was powerful enough to cause the current bar to close lower. 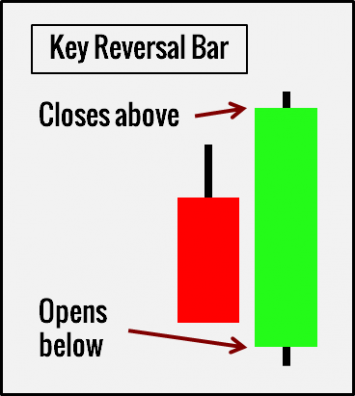 A key reversal bar is a particular instance of a reversal bar that shows clearer signs of a reversal. 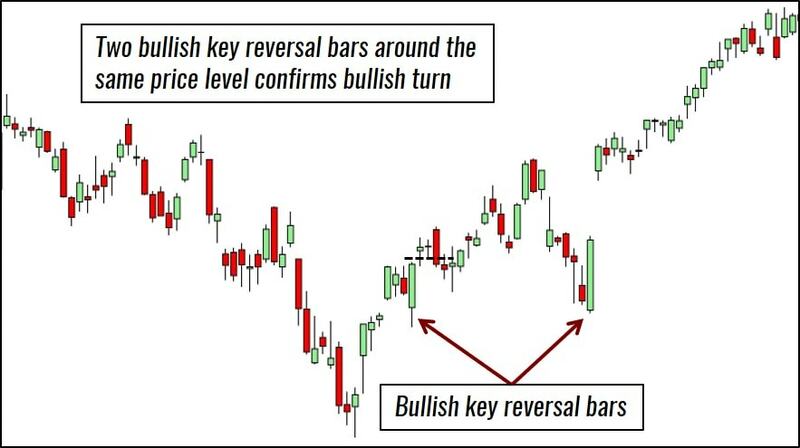 A bullish key reversal bar opens below the low of the previous bar and closes above its high. 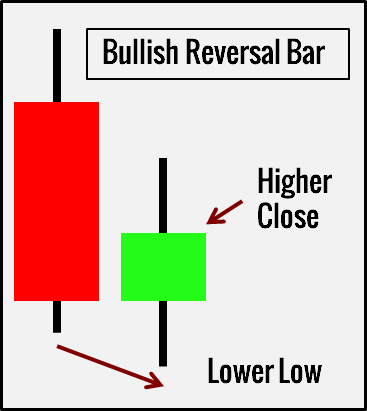 A bearish key reversal bar opens above the high of the previous bar and closes below its low. By definition, key reversal bars open with a price gap. As gaps within intraday time frames are rare, you will find most key reversal bars in the daily and above time-frames. A down gap is a powerful down thrust. When the market rejects such a strong bearish move with certainty, it might have reversed its sentiment to bullish. On the other hand, when a gap upwards bumps into clear resistance, the market might have turned bearish. 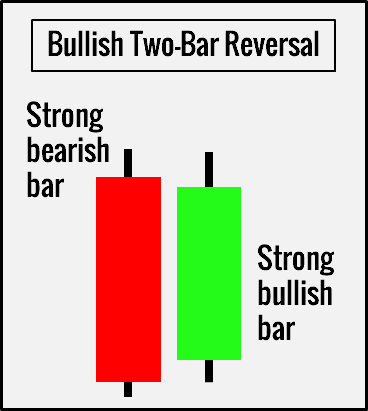 Essentially, a key reversal bar is a violent display of strength that hints at a change of market sentiment. 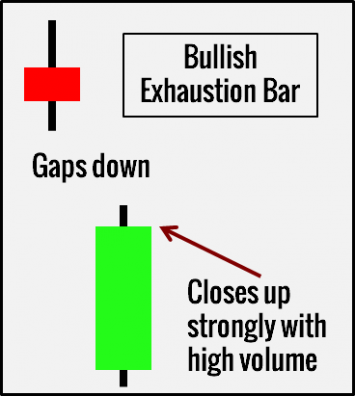 A bullish exhaustion bar opens with a gap down. Then, it works its way up to close near its top. A bearish exhaustion bar opens with a gap up before moving down to close as a bearish bar. In both cases, the gap remains unfilled. Also, high volume should occur with the exhaustion bar. Its name explains it all. It represents exhaustion and a failed last-ditch attempt. After the bears are exhausted, the bulls will take over, and the market will rise. After the bulls are exhausted, the bears will take the market down. It resembles the nose of Pinocchio. It has a long and distinct tail. 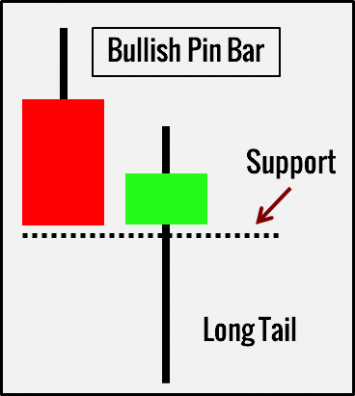 For bullish pin bars, the lower tail takes up most of the bar. For bearish pin bars, it is the upper tail that dominates. Paraphrasing Martin Pring, the pin bar lies like Pinocchio. With its long tail, a pin bar breaks a support or resistance momentarily to trick traders into entering the wrong direction. These traders are trapped, and there is often money to be made when you find trapped traders. Find more pin bar examples here. 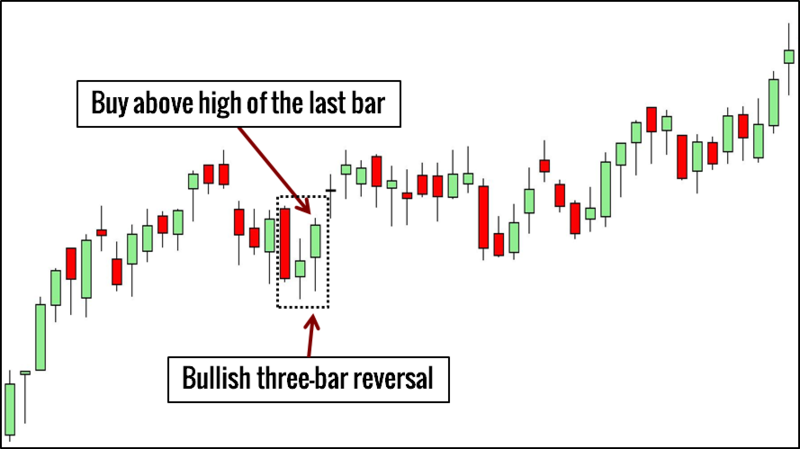 The two-bar reversal pattern is made up of two strong bars closing in opposite directions. The bullish variant consists of a strong bearish bar followed by a bullish bar. Reverse the order to get its bearish counterpart. Every reversal pattern works on the same premise. A clear rejection of a downward thrust is a bullish reversal, and a clear rejection of an upthrust is a bearish reversal. In this case, the first bar represents the first thrust, and the second bar represents its rejection. 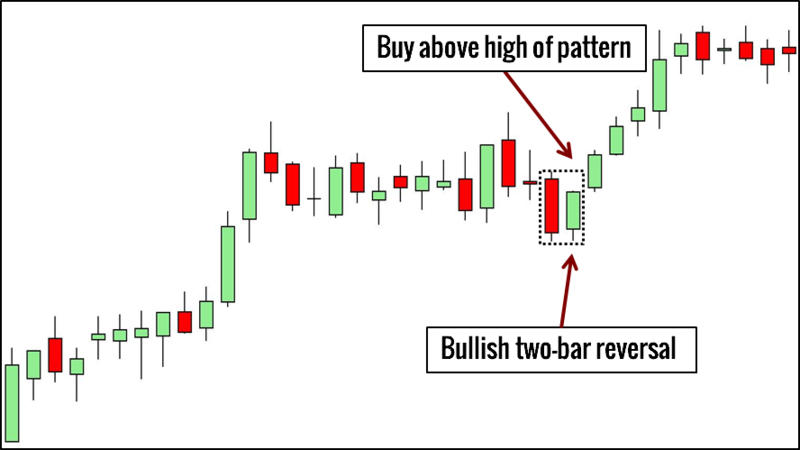 For bullish reversals, buy above the highest point of the two-bar pattern. 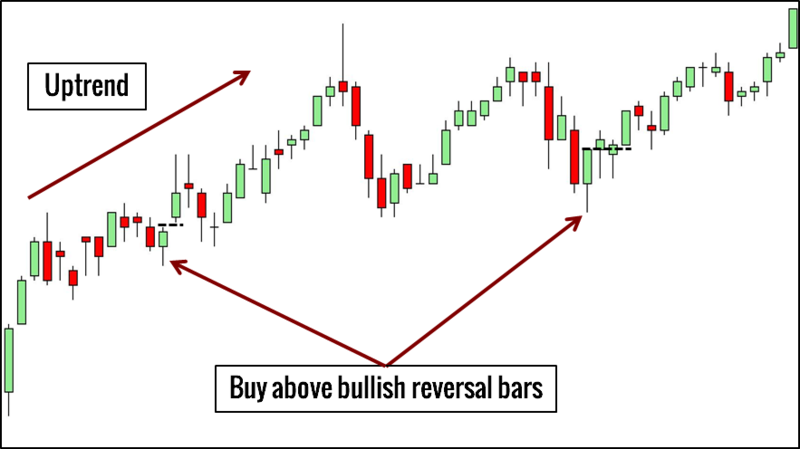 For bearish reversals, sell below the lowest point of the two-bar pattern. 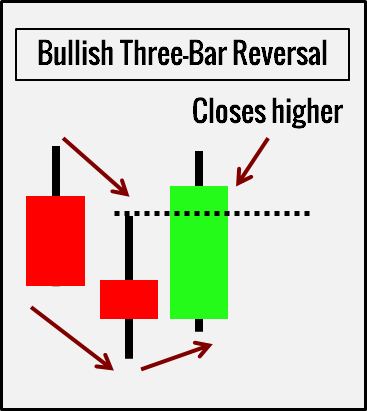 A three-bar reversal pattern shows a turning point. Compared to the other reversal patterns, the three-bar reversal pattern is the most conservative one as it extends over three bars, using the third bar to confirm that the market has changed its direction. This bar pattern is easy to identify. 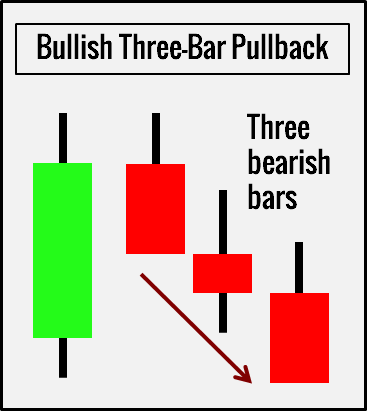 Three consecutive bearish bars form a bullish pullback pattern, and three consecutive bullish bars form a bearish pullback pattern. When the market is trending, it is hard to sustain a counter-trend pullback. Hence, after a pullback of three bars, the trend is ready to resume. Within a bull trend, wait for three consecutive bearish bars. Then, buy above the next bullish bar. Within a bear trend, wait for three consecutive bullish bars. Then, sell below the next bearish bar. An inside bar must stay completely within the range of the bar immediately before it. In other words, the second bar must have a lower high and a higher low. An inside bar is a contraction in price range/volatility. Within the same unit time, the market covers less ground and stays completely within the range of the previous bar. Place only one order (buy or sell) according to the market trend. Wait for a breakout of the inside bar and trade its failure. An outside bar pattern is the polar opposite of an inside bar. This bar pattern requires seven bars. If the last bar has the smallest bar range within the sequence, it is an NR7 pattern. To clarify, bar range refers to the difference between the high and the low of a bar. Like the inside bar, it indicates decreasing volatility. As the lower volatility comes within the context of seven bars, instead of a single bar like in the case of an inside bar, the NR7 pattern is a stronger sign of decreasing volatility. 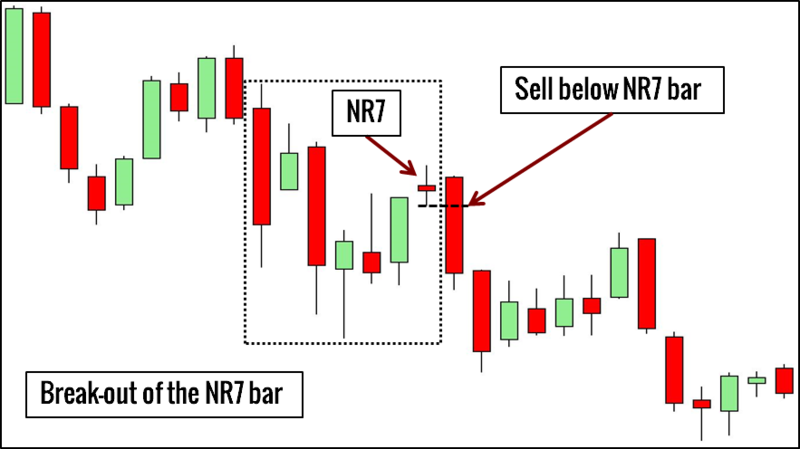 However, while the inside bar shows no strength in either direction, the NR7 pattern might drift upwards or downwards. In such cases, the NR7 represents a price thrust with decreasing volatility. 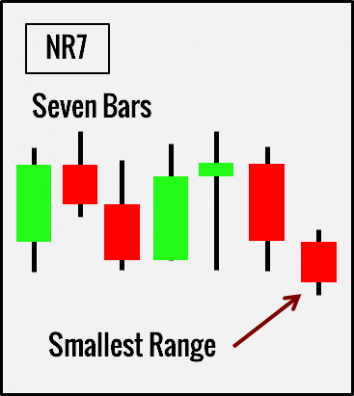 As the market alternates between range contraction and range expansion, the NR7 alerts us to standby for explosive moves. These ten patterns are not mutually exclusive. In fact, many combinations produce valid bar patterns. 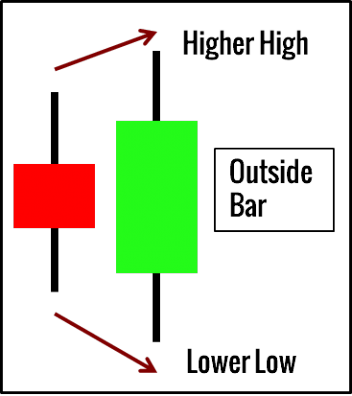 Bar patterns alone will not offer a trading edge. Common strategies incorporate market bias analysis, chart patterns, and volume analysis into the mix. Bar patterns form just one facet of a price-based trading approach. Bar patterns represent just one aspect of a price-based trading plan. Corrected! Thanks for pointing that out. 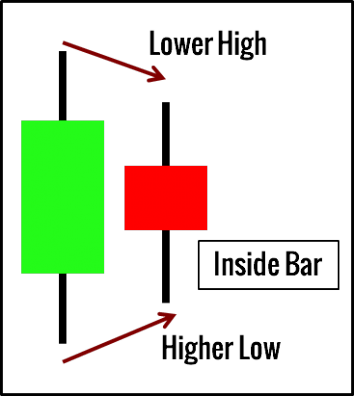 In the above article you have simplified the ten candlestick bar patterns with well defined entry points. Could you also elaborate exit strategies for these patterns? Unlike chart patterns, candlestick patterns do not have measuring rules for exits. An ideal exit strategy should take into account the market trend, S/R, volatility, and your time frame, and should tie in with your entire trading strategy. You can refer to this article for some ideas. 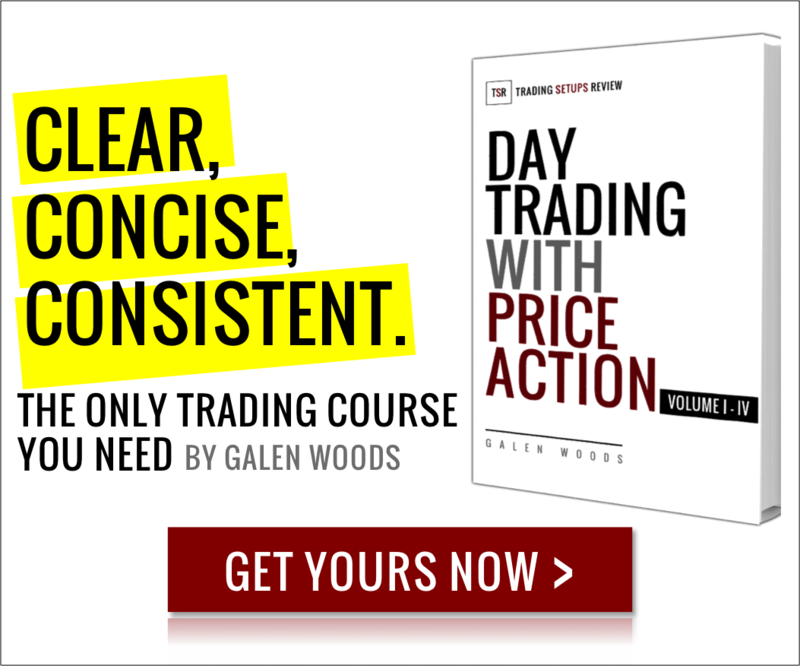 What is the best timeframe for price action strategy? Will the indicators work with Tradestation? If not maybe in the future. Hi Brian, which indicators are you referring to? You’re right! Thank you for pointing out the error. I’ll replace the example soon. I am a beginner in stocks and stumbled on your site and I must say is got the most logical explanations of stuff. In exhaustion bar you have mentioned that the gap remains unfulfilled. Can you please explain the significance of unfulfilled gap versus a filed gap? Hi, thank you for the question! It gives me a chance to clarify that section. When I wrote that the gap remains unfilled, I was referring to an opening gap that remains unfilled within the same session. As you can see from the examples, the gap can be filled by the price action in the following sessions. 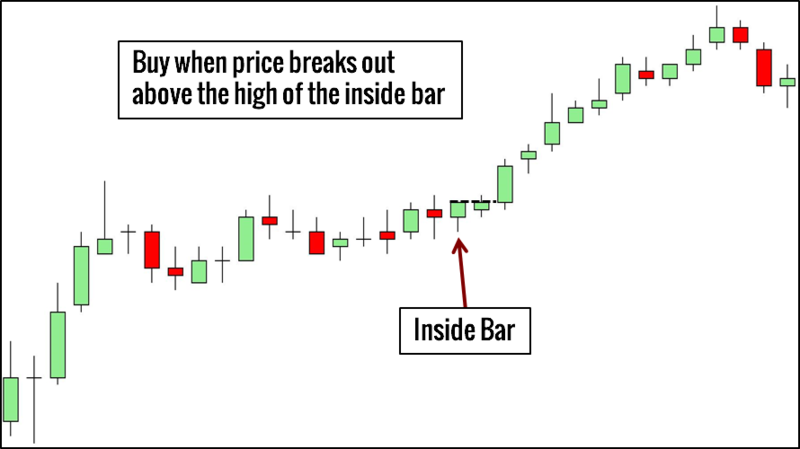 If an opening gap is filled within the same session, it will become a key reversal bar or a variant of it, depending on where it closes. I love your website. My winning percentage has increased dramatically just from waiting and watching for reversal bar patterns at key levels. Thank you! I now incorporate reversal bar patterns into my trading plan as one of multiple factors for entering into a trade. There are additional factors I look for, but, the more evidence to support entering into a trade, the better! Hi Rob, thank you for your kind comments. Looking for reversal patterns at key levels might sound simple, but it’s a really sound starting point for any price action trader. All the best to you!